Although all six finalists have very different styles and personalities, in a line-up it's Krüger's Petit Skull that almost leaps out at you. Punky, funky and in your face, it is expressive, festive and flamboyant and the product of an art-dyed creative imagination. You can tell that I'm a fan of this up and coming lady's work, having watched how, in only a couple of years, Fiona Krüger has established her rising star thanks to her unique and extroverted style, however I'm not forgetting that the Aiguille award for best in category is a serious business, and the opposition formidable, so can the Petit Skull Eternity go all the way? In an admiring sense, it's outrageous, but it can't help but put a smile on the faces of those who see it. It is a watch which goes hand in hand with a sunny personality, and so in terms of being an uplifting piece, it certainly has something that none of the others can lay claim to, and that is the ability to brighten up a room just by being in it. 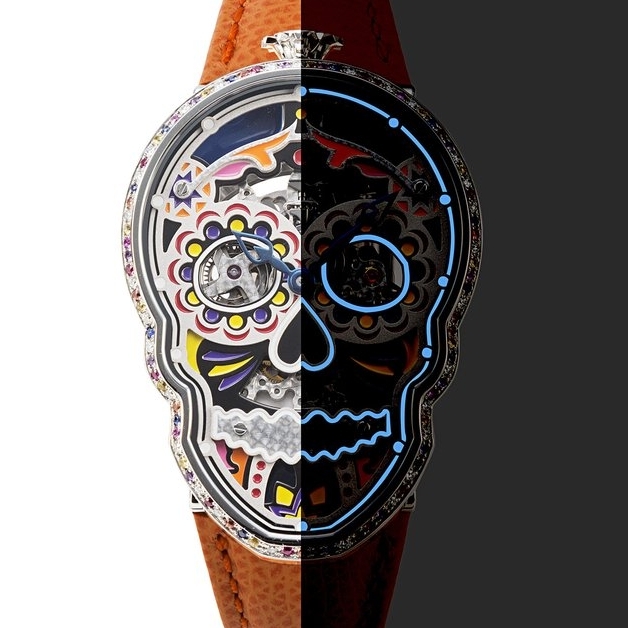 The vivid colours are patiently applied by hand, using a lacquer and brush, and the whole skull theme is a celebration of the Mexican folklore and the Dia de los Meurtos festival. In darkness, its facial features glow brightly with a powerful electric blue lume. However, as much as I love it, there are others who would not, and so one must assume that on a panel of judges, there will be lovers and there will be the unmoved, so where does that leave us? Well, uniquely it is the only piece which outsources its movement, which has become a 'thing' in recent times, even though this is common practice even among the great and the good of the luxury watch sector. All the same, it might put a distance between itself and its rivals. In this particular category, for a ladies watch from what is little more than a one-woman show to have battled through the grandées to make the final, it would be the most perfect fairy tale ending to a phenomenal year for Fiona Krüger. 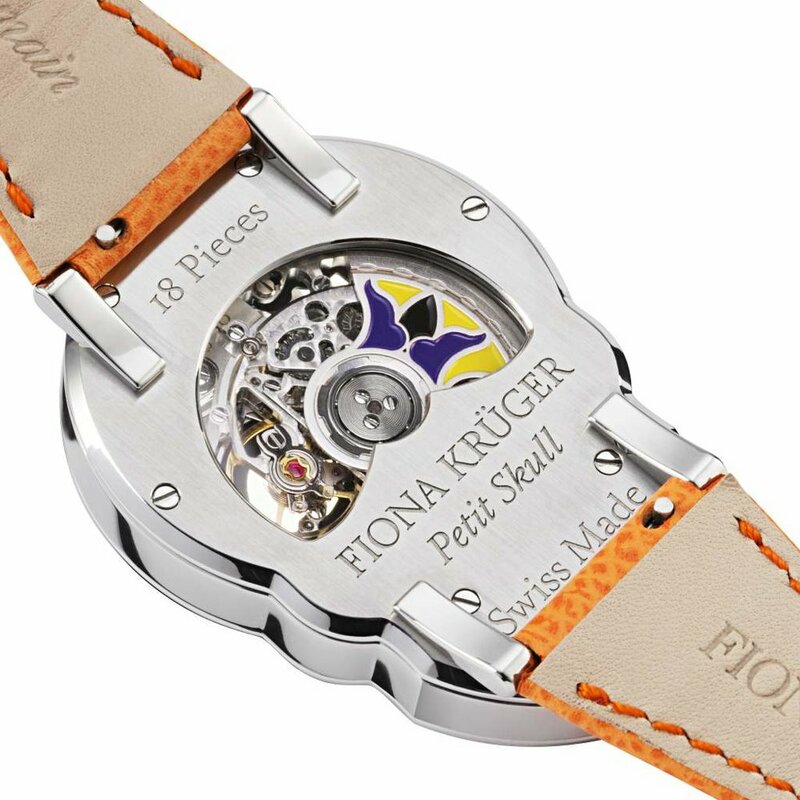 A win would be fitting and very pleasing; for independents, for women in watchmaking and for sheer extravagance, but I think it might have already surpassed expectations, whilst simultaneously heightening awareness of Fiona Krüger, the new leading lady of independent watchmaking. So it's a win for sure, but no Aiguille. And I would love to be wrong.